So many Travel Plans for 2019! Well – the answer is simple and shows a little bit of my craziness: I needed the miles! Oh and I wanted to see something new. In order to get my frequent flyer bonus program to the next level, I needed another 6000 miles to reach my gold status. Now I got it! (PARTYYYY!) I´m happy AND I saw Abu Dhabi. Yeah. So if you´re ever in the same situation …meaning you have 24 hours in Abu Dhabi, this is what you have to do, see and what you can skip! I can already tell you one thing – some of you are not going to like what they will read in the follow passage. 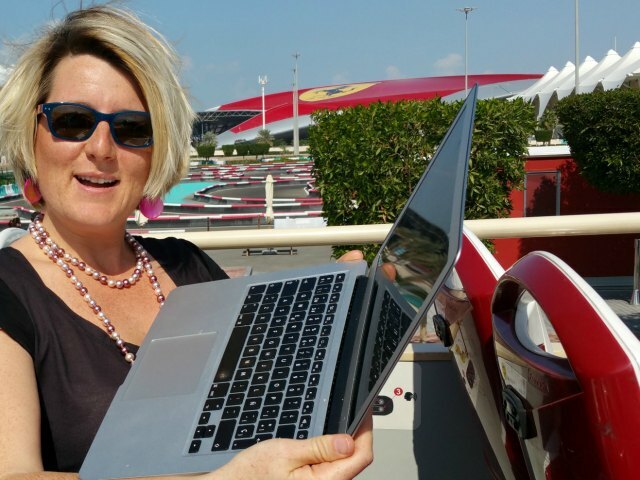 But it´s what I´ve learned in 24 hours in Abu Dhabi. So please keep reading and hear me out. Walk along the Corniche. At this point I would like to say something about the your safety in Abu Dhabi: For a city with 1,4 Million inhabitants Abu Dhabi has a very low crime rate. I felt very safe. That changed however, when I started walking around the streets with a friend who lives in the city. He taught me to always make sure that there´s a street light or a traffic light pole somewhere near, when walking along a busy street. If certain people – usually NOT emirates! – want to attack western-looking individuals, they often do that by running them over with one of these gigantic car that almost everybody drives in Abu Dhabi. Apparently that has happened quite a few times in the past. So walking around the streets doesn´t seem to be the safest thing to do. At the Corniche however there are no cars and you can walk or cycle safely along the beautiful beach and coastline. 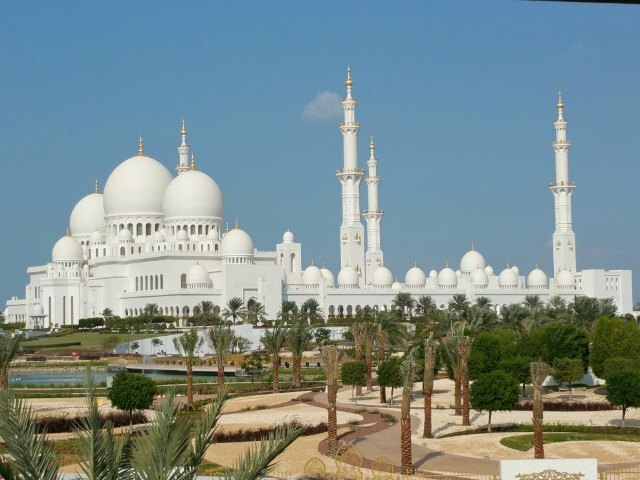 The Sheikh Zayed Mosque. This fairly new mosque holds roundabout 40.000 worshipers on Fridays. Remember that tours are not available on Fridays! Three times a day the tours are free for the BIG BUS Ticket-holders, so you can save some money right there. If don´t want a tour, you can go in all by yourself. It´s free of charge. Just remember the very strict dress code and don´t forget it´s a holy place – so be respectful. The heritage village. 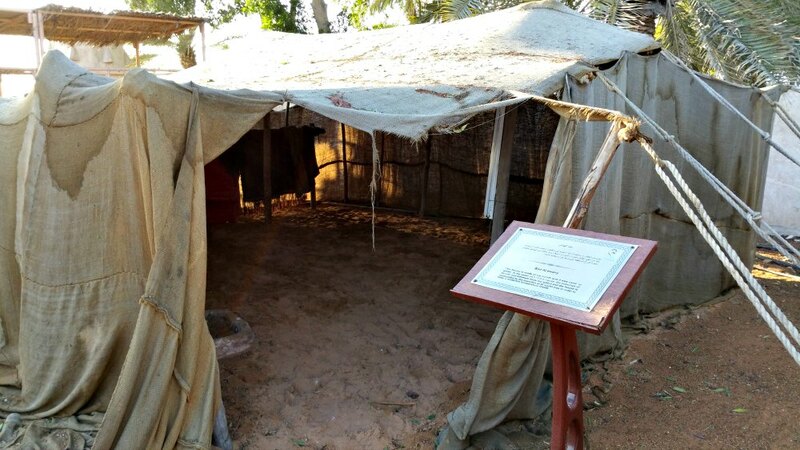 Abu Dhabi and the U.A.E where found in 1971 …before that most Emiratis used to live in tents! So, yes, everything in this city is fairly new. However, if you want to learn something about the history of these people —that´s one of the two places where they show you how they lived less than half a century ago. Yes it´s touristy, but it´s free and I think they did a great job demonstrating how the nomadic people, the pearl divers and the fishermen used to live. 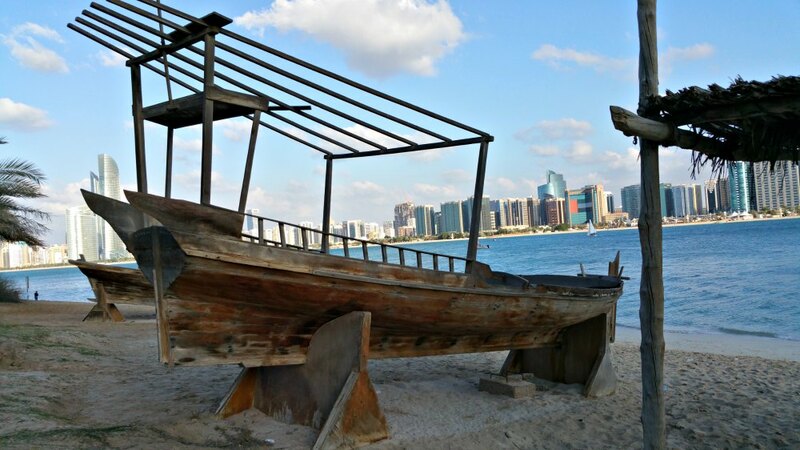 If you have time and do not want to go into one of the crazy big malls in Abu Dhabi: Go on the Dhaw Cruise along the corniche! (included in the BIG BUS Tour). If you don´t like boats, and you can afford it: go to one of beach clubs or the public beach. You also have to pay, but very little. The beach is divided in two sections: One for single men and one for women, children and families. The water is warm – even in the winter and only there it is okay to run around in a Bikini. When it comes to clothing I would like to advice you to use common sense. It´s a islamic country. 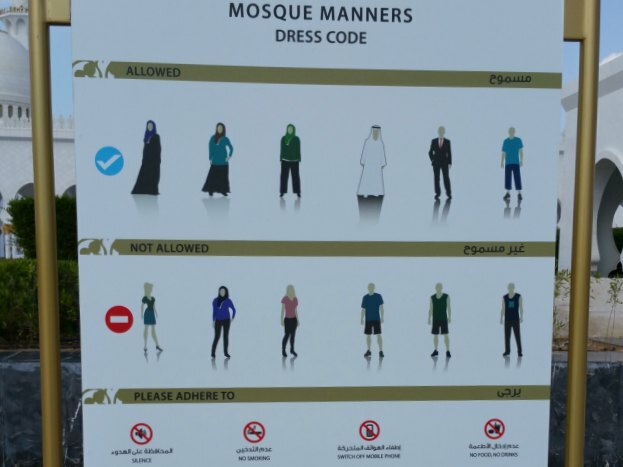 Not only is it disrespectful, but believe me you don´t want the looks of the women covered in their burkas when you´re running around wearing a tank top and hot pants. The „Empty quarter“– the desert has a special atmosphere and quietness that is hard to describe. My desert tour got cancelled due to the rain, but I would have loved to spend time in the desert again. It´s very special. The Souk – all the souks here are copies of other Souks like in Istanbul for example. I definitely like the original once better and I am not a big shopper anyways, so I skipped that. „Havanna Bar“at the Emirate Palace. On Tuesday night they have live music and it was fantastic! But I would still skip the Emirate Palace next time. Mostly they smoke a lot at the Havanna bar. I was already wearing my close for the flight back, so as I am sitting here typing these lines, my shirt still stinks of Havana cigar smell. Besides you don´t see a lot of the Emirate Palace – so better watch a movie about it. YAS Waterworld. It was voted the second best water park in the world once, but let´s face it, if you are not traveling with children, or are bit childish yourself – do you really need to go to a water park where they charge you 55 Euros to get in?! Only to get really wet and scream a bit?! (well – some people might .. I don´t! Especially because from the outside it looks by far not as amazing as it did in the movie! 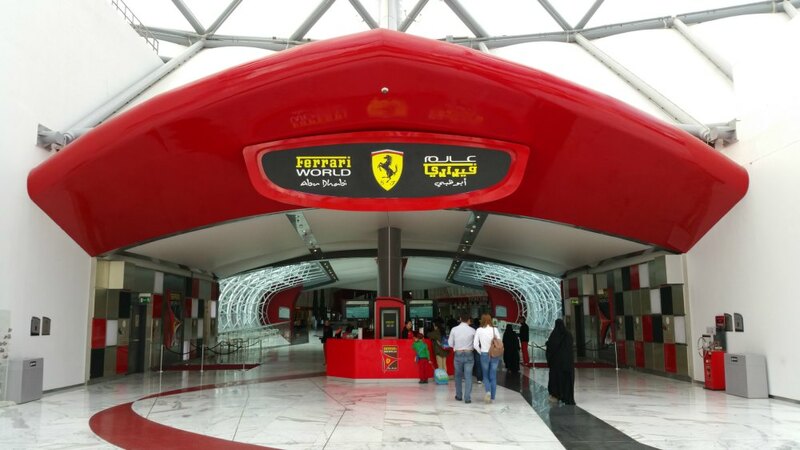 YAS Ferrari World – I don´t need to go on a 240 km/h roller coaster ride and I also don´t need the world´s largest indoor theme park. But I am also not a theme park-person. YAS Mall – with its 400 stores is the second biggest mall in the U.A.E., but I still skipped it. After all- Malls are all: SAME, SAME, BUT DIFFERENT, right!? YAS Marina Circuit. Due to the tight schedule I also skipped the Formula One racing track. I looked at it. I took a picture, but I didn´t go on the two hours tour behind the scenes. Besides it was empty anyways. The marina itself and the hotels nearby look fantastic! So if you are a formula one fan: YAS ISLAND is your choice. Free shuttle buses take you around this widespread area. If it´s summertime: Skip renting a bike. I guess in the winter months it´s ok, but 48 degrees Celsius and more is way to hot for cycling in the burning desert-sun. If traveling with Air Berlin: SKIP the Airberlin Connect offer. On the flight back, we were offered to use the onflight Wifi. Skip it! Why? It´s way to expensive for what you get. The connection is unstable. It´s slow and extremely limited. And the time you waste trying to get connected to the wifi is valuable time where you could be sleeping! I hope my list is going to help you make your stay #inAbuDhabi an enjoyable experience. I most definitely don´t regret it and for the first time in my life, I don´t feel bad because I chose the „touristy-way“ to explore a city. With more time I would have rented a car and explored everything by myself. But with a limited time I had, I am convinced that the BIG BUS TOUR was the cheapest and most efficient way to discover ABU DHABI. Barbara is a Mallorca-based blogger / radio-journalist / ocean lover / traveler. Diving and traveling are her two great passions. She´s a small-town-girl from Germany, but moved to Spain in 2006. In her own blog www.mallorca-talks.com – she writes out the people and the hidden treasures of her beautiful new home. 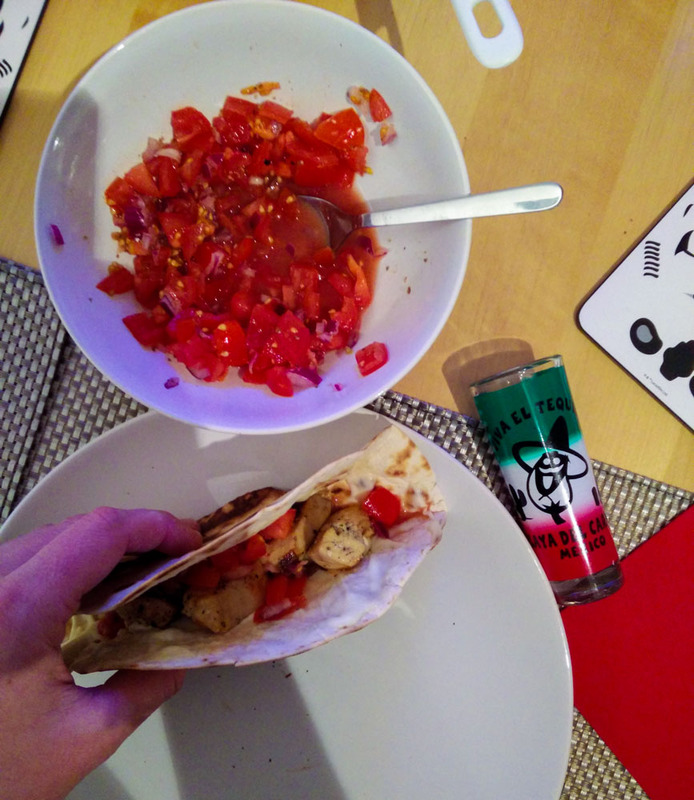 Thanks a lot for letting me write for your cool blog! Hope you will one day write one about Mallorca for me!!! Pingback: Mallorca Battle mit Abu Dhabi - wer ist der wahre Sieger?! Sign me up for "Newsletter from Abroad"! My heart belongs to the ocean. 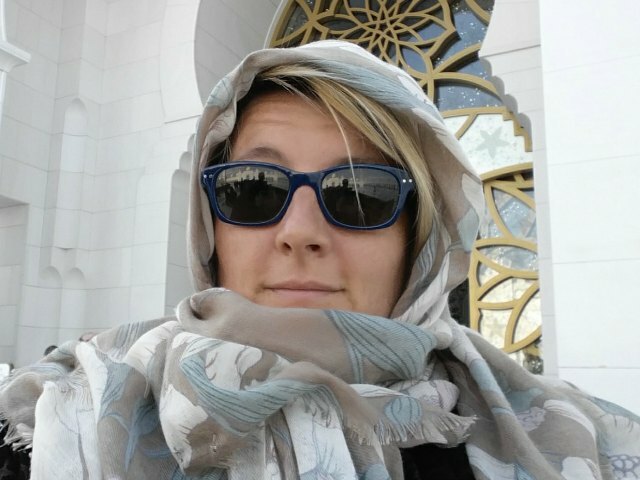 I'm Viki and I dive, travel and blog. My Dirndl is always packed and ready for the next adventure!